Join us for our Open Mic Night! All types of talent will be performed! Spots still available to join in!! Call us at 832-652-8855. We will also have local vendors, free swag bags, and door prizes!! 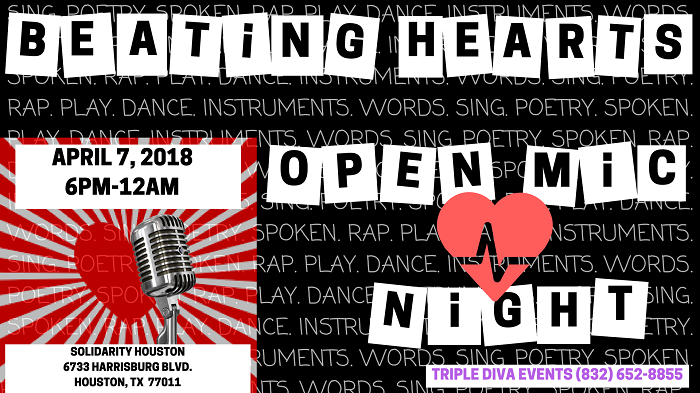 Triple Diva Events presents a very special Open Mic Night Event called Beating Hearts! We are bringing talent straight from the Heart!!! Join us for our FREE Open Mic night on April 7, 2018 from 6pm-12am!! Houston's own, Kris Smith, will be joining us on stage!! Come listen to his amazing written words. Anyone is welcome to join!! Sign ups are open to perform at our Open Mic representing ALL KINDS of TALENT!! Bring your shine!! We will be live recording the night! Bring your drums and chairs for a closing drum circle bringing in the positive flows of intent. We will also have local vendor booths set up with awesome products & services, as well as, checking out the venue! FREE SWAG BAGS full of goodies to the first 50 guests!! We will also have raffles & prizes to win! Raffle tickets are $5 each or 6 for $25 and can be purchase anytime before or during the event. All proceeds benefit the drive. So come relax and kick back with some encouraging words, laughs, musicians, artists, etc. Let's make this community get again by getting together and enjoying life!!! For the parking situation: Either at Walgreens across the street or behind Solidarity. Or for instance if you're coming from downtown once you arrive at the Harrisburg & Cesar Chavez light make a left on Cesar Chavez then make a right on the next block with train tracks. Park by the train tracks. Enter through the big open semi rusted gate and enter through the first door downstairs. Parking is free. And with that let's make it happen tomorrow. If you would like to signup for the Open Mic or to setup a vendor booth, please contact Triple Diva Events at (832) 652-8855 or tripledivaevents@gmail.com.